Conflicts can arise when someone positions a leader or places a tile. Revolt: A revolt occurs when a leader is positioned in a kingdom that already contains a leader of the same color. War: Wars occur when two kingdoms are united through a new tile, and the new, larger kingdom contains leaders of the same color. Leader placement can only cause revolts, not wars. Tile placement can only cause wars, not revolts. 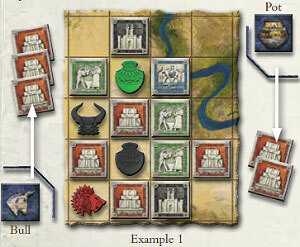 The conflict is resolved using tiles on the board and additional tiles played from behind the screens. An action does not end before the conflict is resolved. After all conflicts have been resolved, a kingdom will only contain leaders of different colors. Conflicts are resolved as described in the following two sections. A revolt occurs when a leader is positioned in a kingdom that already contains a leader of the same color. During a revolt, the player positioning the new leader is the attacker. The controller of the existing leader of the same color in that kingdom is the defender. Both the attacker and the defender draw their strength from temples. Count temples adjacent to leaders: Both the attacker and the defender draw strength by counting the number of temples adjacent to their conflicting leaders. A temple can count for both leaders. Players commit temples from their hands: First the attacker, and then the defender, may increase their strength by committing to the conflict any number of extra temples from their hands, placing them faceup in front of their screens. Each player can commit extra temples only once. Whoever has the higher total strength (total number of temples) wins the conflict. The defender wins ties. Example 1: The attacker (Pot) has three temples adjacent to his leader, and the defender (Bull) has two temples. The attacker commits two extra temples, while the defender commits three extra temples. Hence, each player has a total of five temples. It is a tie, so the defender wins. The loser must withdraw his leader from the board. The victor gains one amulet (because the conflict was fought with temples). Both players remove all committed temples from the game, placing them facedown in the box. Wars occur when two kingdoms are united, and the new, larger kingdom contains leaders of the same color. Remember that two kingdoms can be united through tile placement but not through leader positioning. Three or more kingdoms cannot be united by one tile. No victory point is gained when a tile is placed that unites two kingdoms. Instead, that tile is covered by the unification tile. A new, larger kingdom is created. If the new united kingdom contains no two leaders of a like color, remove the unification tile and conclude the action without resolving any conflict. However, if the united kingdom contains leaders of the same color, war erupts. All conflicts between two like-colored leaders are resolved individually. Each time there are wars between leaders in more than one color, the active player decides which war to resolve first. For each war after the first, players resolve the war using the kingdom's current configuration, as recent wars might have disrupted the connection between leaders and tiles. All victory point and treasure tokens gained and tiles behind a player's screen are hidden information; they are kept secret from other players until scoring. he number of tiles in the bag is hidden information; players cannot deliberately count the tiles in the bag. Tiles that are removed from the game are hidden information; they are kept facedown in the box and cannot be viewed by any player. Determine who is the attacker: If the active player chooses to resolve a conflict that involves one of his leaders, he becomes the attacker. Otherwise, the next player (in clockwise order) with a leader involved becomes the attacker. The other player involved in the conflict is the defender. Count the supporters: Both the attacker and the defender draw strength by counting their leader's supporters, which are tiles of like color on the board that are still connected to the leader. These tiles need not be adjacent to the respective leader. They only have to be in that part of the kingdom on his segment of the unification tile. Players commit tiles from their hands: First the attacker, and then the defender, may increase the strength of their supporters. They do this by committing to the conflict any number of extra tiles of the matching color from their hands, placing them faceup in front of their screens. Each player can commit tiles only once. Whoever has the higher total strength (supporters on the board plus tiles committed from hand) wins the conflict. The defender wins ties. Winning a revolt: After a revolt, the winner gains one (and only one) amulet. Winning a war: After a war, the winner gains one victory point token of the matching color for each tile (plus the leader) that the loser removes from the board. Example 2: There are two wars: one between the traders and one between the kings. The player who united the kingdoms decides to resolve the trader war first. The attacking Lion player counts one supporter (i.e., market) in his kingdom 1 and commits four extra markets. The defending Pot player has two supporters in his kingdom 2 and commits one extra market, even though this is not enough to influence the outcome. (He uses this opportunity to discard an unwanted market tile). The attacker has a total of five strength, while the defender has three. The attacker wins. The loser must withdraw his leader and remove all supporters from the kingdom. The victor receives one victory point that matches the color of the withdrawn leader and one (also of matching color) for each of the supporters that are removed from the board. The tiles committed from any player's hand do not count toward victory points. The defeated leader is returned to the losing player. Supporters of the defeated leader, and any committed tiles added by both players, are removed from the game and placed back in the box. If two priests cause a conflict, then there is an exception: temples (i.e., supporters) which bear a treasure, or have another leader adjacent to them, are not removed. Amulets are only gained for the defeated priest and the temples actually removed from the board. When a tile is removed from the board, it might cause the kingdom to be divided into two or more parts. As a consequence, leaders originally exposed to war can end up in different kingdoms. If this occurs, then those leaders are no longer in conflict. However, if there are still leaders of like colors in the kingdom, a new war commences with the active player determining which conflict is resolved next. (The active player can influence events by choosing the order of conflict resolution). After all wars are resolved, the active player's unification tile is removed and placed back outside his screen. At the end of the active player's turn, all other players who have committed tiles from their hands also refresh their hands back up to six. Example 2 (continued): The losing Pot player removes his merchant 1 and both of his supporters 2. The victorious Lion player gains three goods 3. The five committed tiles on both sides are removed from the game 4. At the end of this war, the kingdom is divided into two parts. The kings are not in the same kingdom, so they are no longer in conflict. In this case, the second war between the kings does not occur. The unification tile is withdrawn from the board 5; the tile that it was covering remains. The action is concluded. During a revolt, a single temple can be used by multiple leaders. 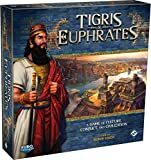 If a player uses a catastrophe tile to block a space containing a temple that is adjacent to a leader and that leader is no longer adjacent to a temple, that leader is removed from the game board. 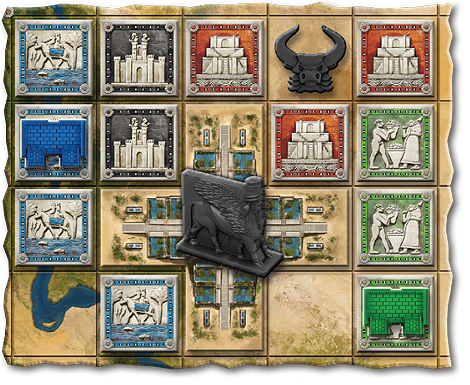 If a temple is flipped facedown or replaced with the wonder tile, any leaders adjacent to that temple that are no longer adjacent to any other temples are removed from the game board. 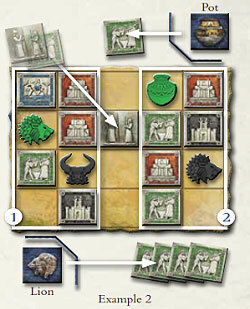 When a player loses a war with a priest, he cannot remove temples from the game board if those temples either contain a treasure or are adjacent to leaders of any other color (king, trader, or farmer). The victor does not gain victory points for tiles that remain on the game board due to these exceptions. If a temple contains a treasure token and the active player wishes to use that tile to build a monument or wonder, he temporarily removes the treasure token and either places it back on the tile after the tile is flipped facedown (monument) or places it on the cross-shaped wonder tile (wonder). This treasure token is still in play and players can collect it following the normal rules.